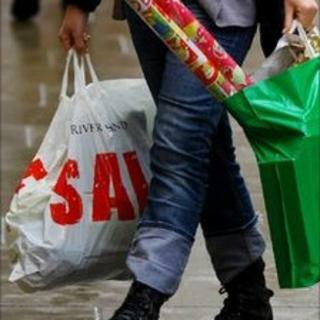 Retailers are hoping the start of the sales season across Wales will make up for takings hit by the big freeze. Many high street stores are opening, even though Sunday trading laws limit shopping to six hours. Despite a last-minute Christmas surge, retailers report disappointing December takings and some smaller stores say they face a challenging start to 2011. The Met Office says the day will stay cold and icy, but no snow is forecast. Steven Madeley, director of the St David's shopping centre in Cardiff, said 95% of its 160 stores will open on Sunday, after a busier-than-expected Christmas Eve. He said: "It is the first day of their sales activity. A lot of shoppers plan Boxing Day shopping as part of their routine. "The challenge for the stores will be able to take as much money as they would like in a shorter trading period." David Hughes-Lewis, chairman of Cardiff Retail Partnership, said: "For a lot of retailers, Sunday is their second best day of the week, after Saturday. "A lot of people are in the habit of shopping on Sunday." He said smaller independent stores may not open in the city, however, as they needed to give their smaller workforces a rest. He said: "They have not got the volume of staff that some of the bigger shops have got. Gareth Thomas, of Festival Park, Ebbw Vale, said the bad weather had helped the 40 retailers on the site as people had preferred to shop locally, rather than make a 90-minute return journey into Cardiff. He said: "We've got shoppers coming in from further afield, Abergavenny, Monmouth, etc, and it does mean that people, due to driving conditions, will stay local. "And there are not as many last-minute shoppers on the internet because they could not guarantee delivery." Colin Gilligan, centre manager at Broughton Shopping Park, Flintshire, said: "A number of stores have also brought their sales forward, and the VAT rise in January is another incentive to get out and shop now. "It all starts again on Sunday - although we expect Monday will be our busiest day." The Victoria Centre in Llandudno said trade was brisk in the days before Christmas, and a number of shops will also open on Sunday. However, staff again expect bank holiday Monday and Tuesday to be busier. Cyril Baker, chair of Aberystwyth Chamber of Commerce, said he felt December was disappointing for traders. Mr Baker, who runs a jewellers, said shoppers were leaving it later to spend, and the weather had not helped. "I've certainly observed that trade first thing in the morning seems to be much slower than previous years, and slows down again as soon as the sun goes down. "I don't think anyone in the retail industry is expecting the early part of next year to change things for us. "We will all have to work hard and pay a lot more attention to what is making our businesses work." Unlike cities and major towns, Mr Baker said he expected only a handful of national chain shops to be open in Aberystwyth on Sunday. David Norcross, chairman of Narberth Chamber of Trade, said: "I don't think many of our traders are smiling when they go to the bank." "Trade has been slow, the weather has not helped one bit and people just don't seem to have the money they had last year." He predicted 2011 would be "a very difficult year", particularly for a town where so many shops and businesses were small and independently owned.